Jonah Hill Feldstein (born December 20, 1983), professionally known as Jonah Hill, is an American actor, producer, and comedian. Hill is known for his comedic roles in films such as Accepted (2006), Superbad (2007), Knocked Up (2007), 21 Jump Street (2012), This Is the End (2013), and 22 Jump Street (2014), as well as his performances in Moneyball (2011) and The Wolf of Wall Street (2013), for which he received Academy Award nominations for Best Supporting Actor. 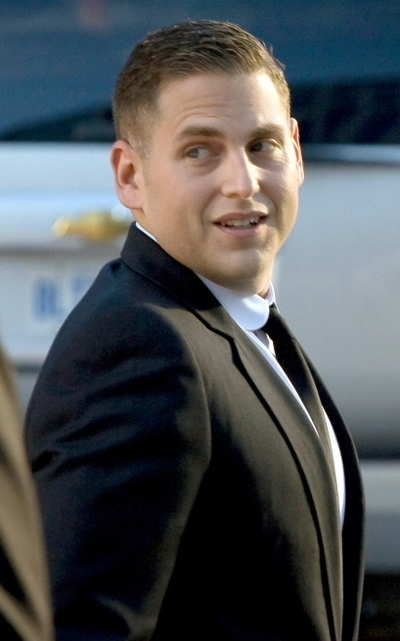 Jonah Hill Feldstein was born on December 20, 1983 in Los Angeles, to Sharon Lyn (née Chalkin), a costume designer and fashion stylist, and Richard Feldstein, a tour accountant for Guns N' Roses. He has a sister, Beanie Feldstein, who is also an actress. His parents were originally from Long Island, New York, and the family vacationed in the Catskills. He grew up in the wealthy Los Angeles neighborhood of Cheviot Hills, where he continues to live to this day, and attended The Center for Early Education, Brentwood School, and then Crossroads School, in Santa Monica. After graduating from high school, Hill attended Bard College, The New School and the University of Colorado Boulder. Hill is Jewish. Hill then made a brief appearance in Judd Apatow's directorial debut The 40-Year-Old Virgin, which eventually led to him starring in a larger supporting role in the Apatow-directed Knocked Up, the role of a virgin video game tester in the comedy Grandma's Boy, an uncredited role of Dewey Cox's grown-up brother Nate Cox in Walk Hard: The Dewey Cox Story, and leading roles in the Apatow-produced Superbad and Get Him to the Greek. On television, Hill played the "RA Guy" on the first season of the Oxygen Network sitcom Campus Ladies. He guest-starred in an episode of Clark and Michael. He was scheduled to host Saturday Night Live on November 17, 2007, which would have featured musical guest Kid Rock, but the episode was canceled due to the Writers Guild of America strike, which took place between November 5, 2007 and February 12, 2008. Instead, he hosted the March 15, 2008, show, which featured musical guest Mariah Carey (who replaced the originally scheduled musical guest Janet Jackson). He guest-starred in an episode of Reno 911! which aired on April 1, 2009. Hill was in negotiations for a part in Transformers: Revenge of the Fallen as Sam Witwicky's sidekick, but this did not go through. He next starred in Judd Apatow's third directorial feature, Funny People, which also starred Adam Sandler, Eric Bana and Seth Rogen. He was an associate producer of the 2009 Sacha Baron Cohen mockumentary Brüno. He guest starred on an episode of The Simpsons called "Pranks and Greens", portraying an immature man named Andy Hamilton who was hailed the best prankster in Springfield Elementary School history. Hill received a Golden Globe nomination, his first nomination, for Best Performance by an Actor in a Supporting Role in a Motion Picture for his performance in the 2011 sports film Moneyball, in which he portrayed his first dramatic role as Peter Brand. In late January 2012, Hill received his first Oscar nomination for Best Actor in a Supporting Role for his role in Moneyball. In 2012, Hill co-starred with Channing Tatum in the film 21 Jump Street, and with Ben Stiller and Vince Vaughn in the film The Watch. In 2011, it was announced that Hill was in talks to appear in Quentin Tarantino's film Django Unchained. Hill almost had to decline a possible role due to his prior commitment to The Watch, lamenting that to act in a Tarantino movie was "the perfect next step" in his career. Hill later rejoined Django Unchained, which was released in 2012. He was invited to join the Academy of Motion Picture Arts and Sciences in June 2012 along with 175 other individuals. In 2013, Hill appeared in This is the End and the film, The Wolf of Wall Street. Hill was nominated for his second Academy Award for his work in the latter film. In an interview with Howard Stern on January 21, 2014, Hill said he earned US$60,000 for his role in The Wolf of Wall Street because Hill took SAG’s "minimum wage". Hill told Stern he did not mind getting minimum pay because he "would have done anything in the world" for a role in a Scorsese film.